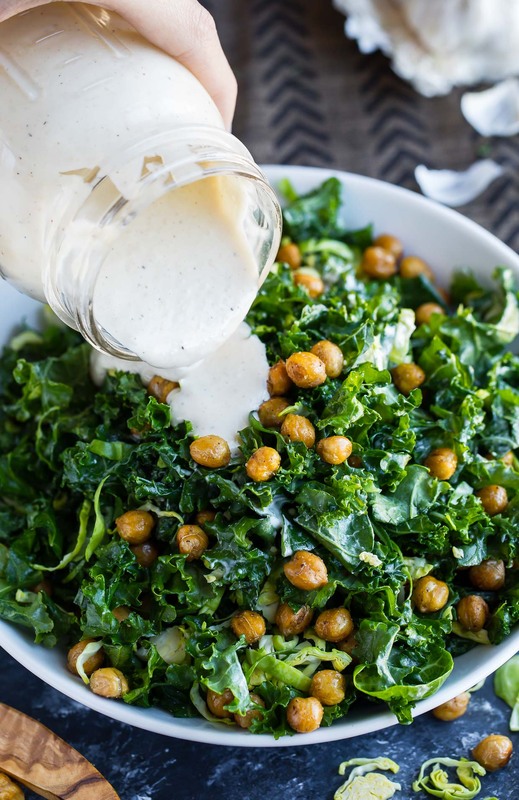 Kale Caesar Salad with Crispy Garlic Chickpeas because we are not about to eat a boring Caesar salad around here! 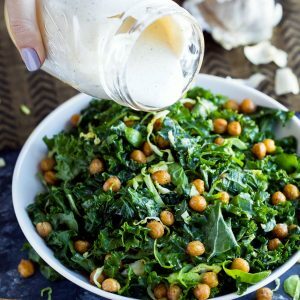 Swapping crispity crunchity roasted chickpeas for the croutons and letting kale take over romaine’s former role in this salad has has me in Caesar salad heaven over here – I can’t wait for you to try it! I’m currently listening to the Alvin and the Chipmunks Christmas album while writing this post because my child is a tyrant and took control of Spotify. While our tunes are wildly out of season (and frankly, a bit painful) this delish dish is PERFECT for February. I welcome it with open arms. All the seasonal eats. In my face. Right meow. I never in a million years thought I’d be the kind of person who loves kale but gosh darn it, I LOVE ME SOME KALE! It’s all in the massaging really. Using your hands to rub the leaves with a teeny bit of olive oil and a pinch of salt transforms this once-spiky and intimidating veggie into a silky, tender, and overall fabulous salad green. Seriously! It’s straight up foodie magic. Of course it was only a matter of time before I let my go-to Caesar dressing in on the fun. It’s time to supercharge our Caesar! Tender kale and shredded sprouts make the ultimate base for this salad topped with a creamy homemade dressing and crispy garlic roasted chickpeas. It’s so completely extra and I love every second of it! 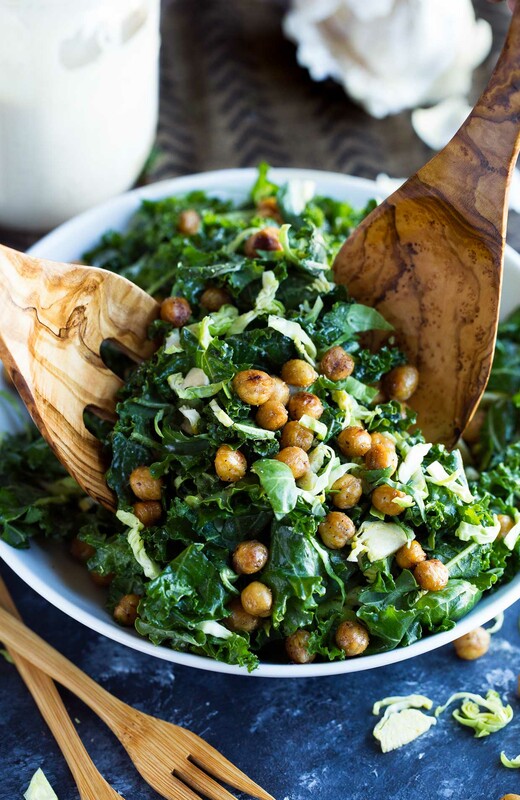 Kale Caesar Salad with Crispy Garlic Chickpeas because we are not about to eat a boring Caesar salad around here! Swapping crispity crunchity garlic roasted chickpeas for the croutons and letting kale take over romaine's former role in this salad has has me in Caesar salad heaven over here - I can't wait for you to try it! First let's make the crispy chickpeas! FOR THE CHICKPEAS: Pre-heat oven to 400°F. Drain the chickpeas in a colander or sieve and rinse well. Pat the chickpeas very dry with a clean dishtowel or paper towels. The drier the chickpeas, the crispier your end result. If you have spare time on your hands you can leave them to air-dry for a few minutes, and remove any chickpea skins that come off while drying. Toss the chickpeas with olive oil, salt, and pepper until all your little chicka-peas are coated, then arrange in an even layer on a baking sheet. Roast on the center rack for 20 to 25 minutes until crispy. While still hot, toss the chickpeas with the remaining spices. While the chickpeas are roasting, whisk together your dressing and chop your veggies. FOR THE DRESSING: use an immersion blender or food processor + combine all your dressing ingredients and blend well. To thin the dressing, add extra lemon juice as desired. You can also make the dressing with simply a bowl and a whisk by mincing and mashing your garlic and using anchovy paste in place of anchovies. Store bought dressing may be used if desired. Wash and dry your kale leaves, then remove leaves from the stem. Chop into bite-sized pieces (I like mine almost shredded) and gently massage leaves to soften. After rinsing your Brussels sprouts, chop the stem/base from the sprouts. Grab a sprout, cut in half lengthwise and lay each half flat on your cutting board. Thinly slice crosswise to create shreds. Repeat for each sprout. Now it's go time! 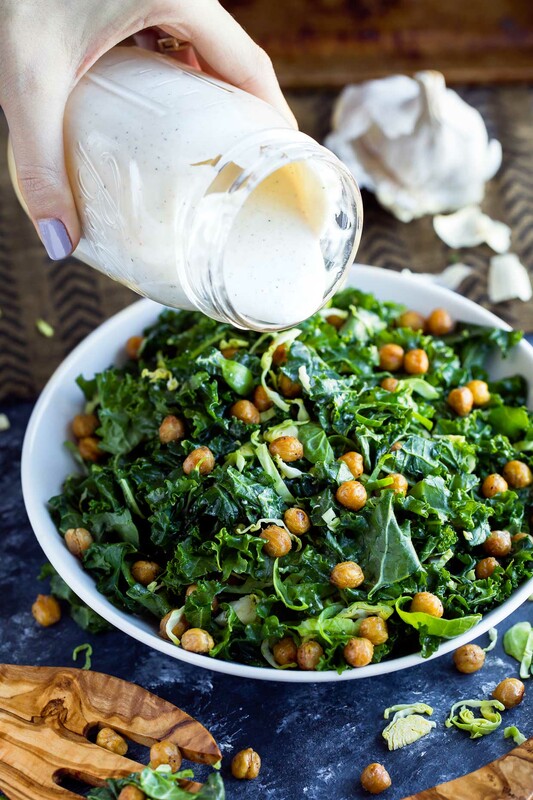 Toss your greens in 3 TBSP of dressing and top with crispy chickpea and grated Parmesan cheese. Additional dressing may be added to taste. Enjoy! * For this recipe I used tinned anchovies and froze the remainder for my next batch of dressing. You can also use anchovy paste if you keep that on hand or score some at the store and you'll simply use 1 tsp of paste for the dressing. You can absolutely use store bought Caesar if you prefer but in case you're crazy for the homemade stuff, I LOVE this homemade Caesar dressing. Love lemon? Before juicing your lemon for the dressing, grate 1/2 teaspoon of lemon zest and set aside for the chickpeas. Once the crispy chickpeas are fresh from the oven, add lemon zest along with oregano and garlic powder and toss to coat. No Brussels sprouts? No problem! This salad is great with just kale. Have freshly cooked chickpeas handy? LUCKY! Use them here in place of canned! Extra lemon juice may be added to thin the dressing to your desired consistency. As written this is a thick, creamy dressing. SO GOOD! Feel free to use store-bought dressing if needed but promise you’ll try this one sometime soon! SO GOOD! Love lemon? Feel free to add some lemon zest to the crispy chickpeas or sprinkle on your salad along with the parmesan to be totally extra with a burst of citrus flavor. Biggest thanks ever to my hand model Sandra for helping me in the studio with this kale caesar salad! I wish I could kidnap her and have here here always. Love you boo! I have been looking for new ways to eat kale – this looks like a recipe I will try. Thanks. This looks so refreshing! Can’t wait to try! Thanks Karly! It’s for sure a great little lunch salad! Thank you Sabrina! 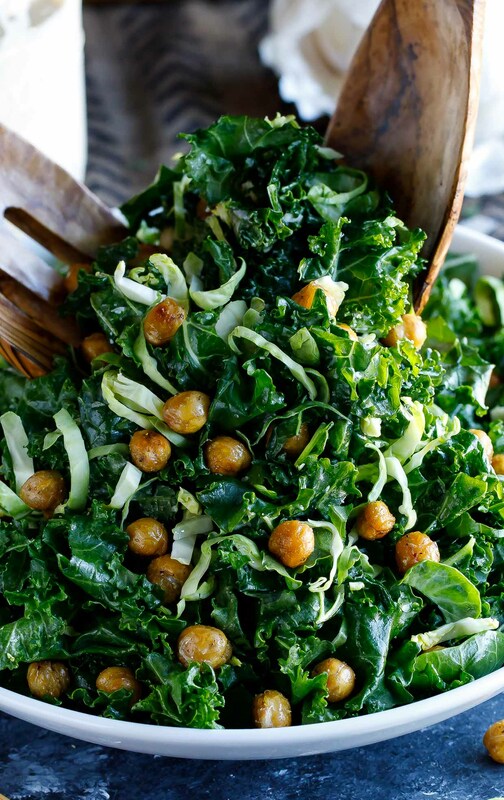 It’s our favorite way to eat kale right now! I had this salad and it was tastyyyyyyy! Thanks for the kale-massaging tip. I’m planning a different kale dish tonight that I’ll try that on, but this salad looks so delicious I expect I’ll be making the entire recipe soon.